England's Olympic champion Rebecca Adlington shrugged off illness to win her first Commonwealth Games gold medal in the 800m freestyle. The 21-year-old built up a significant lead from early on but, with Friday's 400m in mind, eased off as South Africa's Wendy Anne Trott took silver. England's Simon Burnett clinched an impressive 100m freestyle silver medal. Compatriot Ellen Gandy took silver in the women's 100m butterfly, while Wales' Jemma Lowe grabbed bronze. In a successful day in the pool for England, Joe Roebuck also took silver in the 400m individual medley while Stephanie Millward did the same - clinching her second medal in Delhi - in the women's Para 100m freestyle S9 final, won by South Africa's Natalie du Toit. Stomach problems have hit a reported 20% of the England swimming team in northern India, with illness also affecting the Australians. Roebuck was second to South Africa's Chad le Clos while Welshman Tom Haffield - another to suffer illness - finished fourth. "My belly isn't enjoying being in Delhi," he said. 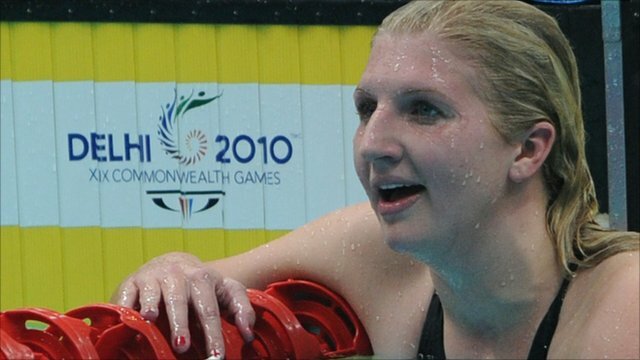 With Commonwealth Games officials investigating whether the quality of the water in the practice pool is causing illness, Adlington, who missed the 2006 Commonwealth Games with glandular fever, was delighted with victory after struggling for full fitness. "I'm so pleased with that swim," she told BBC Sport. "It's not about the time here at all with the stuff that's going on. "My coach told me to stick with the others until 400m, but I thought there's not much point in holding back, just go for it. I'm much more comfortable when I'm out in front. "I could see Wendy edging closer to me but I thought 'there's no way she can catch me' so I eased back a bit and just did enough. "With everything that's going on here you don't want to push yourself too hard. "It's all mental pressure, and I put the most on myself because I want it so badly. The 400m will be a big ask." 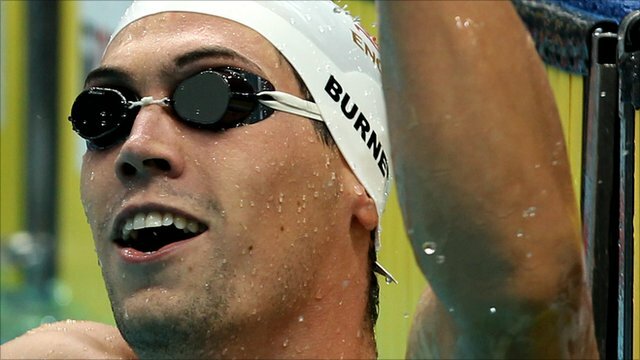 Burnett faced stiff competition at the Dr S P Mukherjee Swimming Stadium but managed to push the fastest qualifier for the final, Australia's Eamon Sullivan, down into bronze as Canada's Brent Hayden won with a new Commonwealth Games record. "I can't believe I got second, I'm absolutely thrilled with that," said Burnett. "Brent has been on fire. I knew he was going to be almost impossible to beat for gold. I was shooting for bronze really because Eamon was also looking really good. "I know when you get in there anything can happen and I just tried to stay tough. That last 10m was very painful." In the first of five finals on Thursday, Gandy was second at the turn and maintained her position to touch in 58.06 seconds to claim her first individual long-course medal. Lowe held on to third in 58.42 seconds as Coutts collected her third gold medal of the Games. On the fourth day of a Games which continues to be dogged by problems, Fran Halsall reached the 50m freestyle finals despite illness. Sprint specialist Halsall - who won 50m butterfly gold earlier in the week - was sick after a warm-up session, but recovered to post the fastest time of the morning in her heat, clocking 25.05 seconds, before finishing first in her semi-final. In the sprint heats, England's Gemma Spofforth set a new Commonwealth Games record of 28.30 seconds in the women's 50m backstroke as she qualified with ease for the last 16. There was also medal success for the home nations in synchronised swimming as England's Jenna Randall and Scotland's Lauren Smith held onto second and third place in the solo free routine, behind winner Marie-Pier Boudreau-Gagnon of Canada. "I got some great marks," said 22-year-old Randall from Surrey, who also finished as runner-up in the same event four years ago. "It is a fantastic pool to perform in and I am really pleased." Randall later won her second silver of the day in the duet free routine with partner Olivia Allison. Smith, 27, was born in England but explained: "I really wanted to compete for Scotland for my dad, he's from Glasgow."